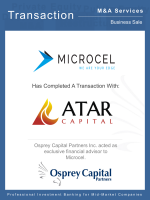 Osprey Capital Partners Inc. is pleased to announce that Microcel Corporation, a leading distributor of technology products in Canada has been acquired by Atar Capital, a global private investment firm headquartered in Los Angeles, California. Rick Henry, Founder of Microcel, will remain a significant shareholder and will continue as Microcel’s President and CEO. Since its inception in 1989, Microcel has become one of Canada’s preeminent consumer electronics distributors, providing access to the Canadian retail market to prominent global OEM vendors covering a wide variety of product types, from wearables, portable audio, computer and telephony accessories, to smart home and outdoor tech solutions. Based in Newmarket, Ontario, Microcel leverages its superior product marketing and logistics support and distributes to a network of over 5,000 points of purchase for some of Canada’s largest big box retailers, electronic stores, e-commerce, and specialty outdoor stores. The owner was interested in finding a partner to help continue the companies’ impressive historical growth and provide liquidity. Osprey Capital planned and executed a highly confidential sale process that targeted a vetted group of strategic and financial buyers & investors. “Microcel has developed a leading position distributing global technology brands into the Canadian retail market. 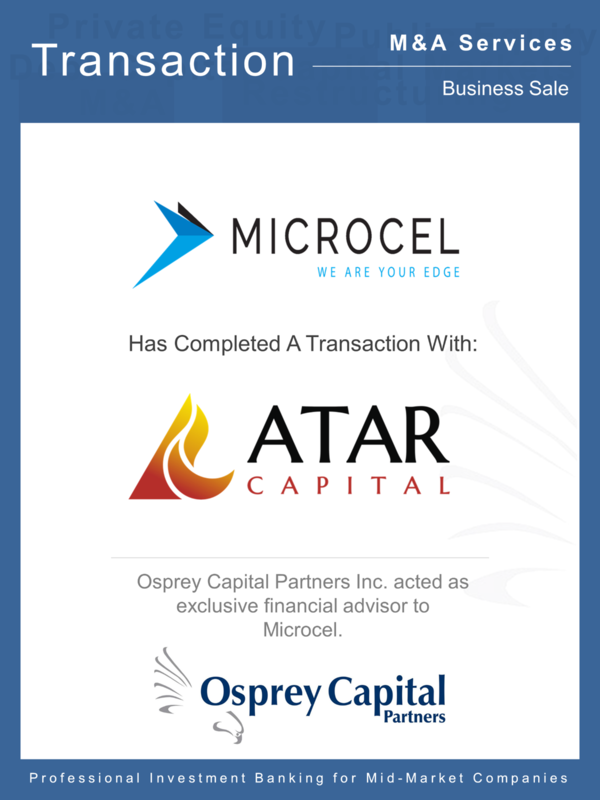 After talking to several potential capital partners, I found Atar’s retail and operational expertise; their flexibility, speed and growth-oriented investment philosophy to be a true differentiator to help catapult Microcel’s market position forward,” said Rick Henry, Founder of Microcel. “We are excited to partner with Rick and the Microcel team on this transaction. We see tremendous opportunity in Canada’s growing retail and e-commerce markets,” said Cyrus Nikou, Founder and Managing Partner at Atar Capital. “Microcel’s best-in-class portfolio of brands within the Canadian consumer electronics space complimented by Atar’s direct-to-consumer, e-commerce and digital marketplace platforms will serve as a catalyst for growth,” added Nikou.